Structural transformation of arctiin and tracheloside, major components of seeds of Arctium lappa and Carthamus tinctorius, were investigated using rat gastric juice (pH 1.2-1.5) and rat large intestinal flora in vitro. 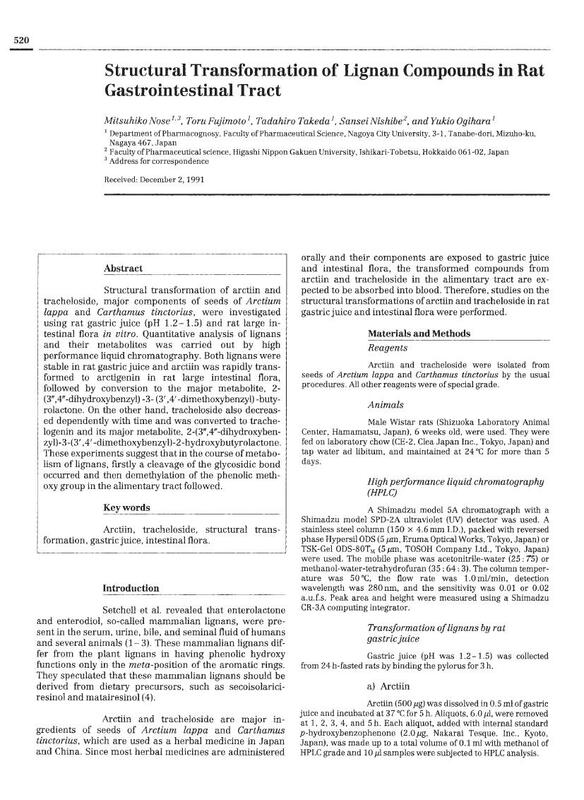 Quantitative analysis of lignans and their metabolites was carried out by high performance liquid chromatography. Both lignans were stable in rat gastric juice and arctiin was rapidly transformed to arctigenin in rat large intestinal flora, followed by conversion to the major metabolite, 2-(3″,4″-dihydroxybenzyl)-3-(3′,4′-dimethoxybenzyl)-butyrolactone. On the other hand, tracheloside also decreased dependently with time and was converted to trachelogenin and its major metabolite, 2-(3″,4″-dihydroxybenzyl)-3-(3′ ,4′-dimethoxybenzyl)-2-hydroxybutyrolactone. These experiments suggest that in the course of metabolism of lignans, firstly a cleavage of the glycosidic bond occurred and then demethylation of the phenolic methoxy group in the alimentary tract followed.